Not so many varieties as last year! 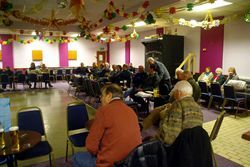 about 40 members attended this year's sale. Quantities were down - probably due to the wet weather and tubers rotting. Prices were up on last year but not as high as 2001 again the cold weather has not had much impact yet. It may be that the plant sale in may does significant business - we'll see. Thanks to all who brought tubers for sale and those who helped in the sale, setting up, clearing down and providing sandwiches & cake. The highest prices were paid for Poms - few tubers and a few determined bidders meant that Moorplace went for £6.60 and Hallmark for £6.50 - much higher than the rest. 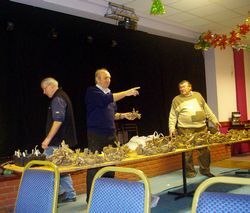 Action during the sale - Tim Williams raising the bidding price, with Paul assisting. 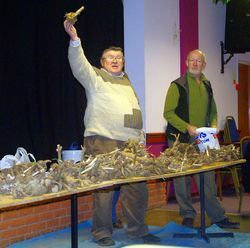 Chief auctioneer Ron Guest targets a high bidder.